Bill devoted his life to the highest principles. These values were the basis upon which he founded the companies more than 75 years ago and which led to the success of his business. Bill leaves a legacy that we at McGlaughlin Oil and Faslube strive to continue. After 35 years in business, Faslube has serviced cars of all makes and models, sizes and conditions, from Chevelles to Chevettes to Acuras and Explorers. The variety of cars that have come through Faslube is a testimony to our high level of service. Thirty-five years ago, we were the first company to offer a 10-minute oil change -- even then, we were using Pennzoil products. 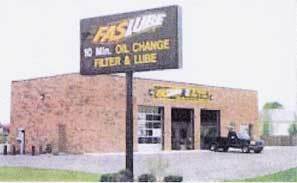 Today, Faslube has delivered more than three million oil changes. Now that's experience. The secret to our success is simple. First, we rely only on Pennzoil products. Second, we're trustworthy. Our customers know they will receive only the service they need. Unlike other shops, our technicians don't earn commission by finding problems with your car. When you need a fast, reliable oil change, bring your car to Faslube, where we always check your car's fluids, filters, belts, hoses, tires -- and more.